Last week, I had the pleasure of attending Strata Data in New York. A lot of great minds sharing ideas around Big Data, Artificial Intelligence and the implementation of both machine and deep learning. Fascinating use cases and inspiration on topics such as how to build an analytics environment with or without data lakes, modelling the data vault way, various technological approaches represented and an agenda that served to deliver both ‘the fast overview’ as well as the ‘deep dive’ into specifics. Sometimes I get asked what my key take-aways are from attending such conferences. Many times, these depend on which sessions I sat in on and which great use cases I had the chance to learn about. Hearing about things first hand is important to me, so I very much appreciate people sharing their stories on how they have leveraged data, BI and analytics in their own project or organisation. One story that touched me was the mum of an autistic kid who had built a data sharing platform, 17 minds, that gathers behavioural information during the day in order to see if any patterns arise across several input data sets. So the child’s teacher notes how the kid performs in school, while a sensor registers the child’s levels of anxiety, heart rate and perspiration. In this way, it was possible to determine which situations and responses triggered the kid’s tantrums. At other times, I get into more technology-oriented debates. Subjects such as whether or not smaller data sets will ever be good enough to allow machine learning, allowing smaller and medium sized companies to benefit from the technology. Currently, although a small portion of data is typically used to train a machine learning model, it still requires a much larger amount of data to see if the model performs as expected in the real world. Could it be that an entirely different approach is needed before we can finally start to use machine learning in business areas that use smaller data sets? In order to answer that, we need to get questions like this talked about. Similarly, in my own case, I used my session to talk about how we as individuals have a right to our own data. During this, I stated that companies who have not started to leverage the value of data in an intelligent way will eventually fail by comparison, since their competitors will gather their data in hubs to analyse, discover new insight and put that data to work. After my talk, one question from an attendee was, “Is it actually possible to gather all the data needed for making a solution like that?” My pragmatic answer? That maybe 80% of the data is a good enough place to start the journey. So what caught my attention at Strata Data? The message board did. It was absolutely low tech. No Wi-Fi or plug-ins, just marker pens and Post-its. 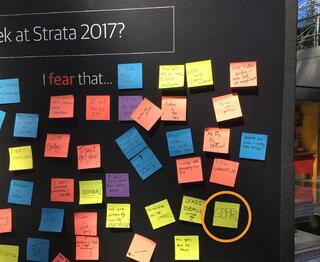 The board was placed in the hallway so that attendees could write their greatest expectations and fears of the Strata Data conference 2017 on Post-its. One in particular caught my eye. Stuck in the middle of curious people’s hopes of gaining knowledge about data lakes and real-life examples of machine learning, just below someone expressing the fear that the shuttle busses wouldn’t be on time, I found a bright yellow Post-it with just four letters written on it – GDPR. I was surprised by this. The General Data Protection Regulation European initiative has had a hard time attracting the attention of European companies, and an even harder time in the case of American corporations. Sometimes I get the feeling that they are collectively putting their heads in the sand. Perhaps they are all trying to ignore the fact that if they do business with Europeans and collect and store data about any individual – even one living in the US who uses a credit card attached to a European account – they will have to be GDPR complaint. Yet there it was, nestled among the hyping of various technologies and people wanting the buses to run on time – the fear of GDPR. So if not my key take-away from New York, then it was most certainly an eye opener. If you have not already begun your journey towards GDPR compliance, you’re not the only one worrying about it. Also read: GDPR - Your running shoes are on, but do you know where to do? Think about it now. What is your biggest fear around data in the coming months?